Columbus Day is a national holiday celebrated in America. It is celebrated as the anniversary of Christopher Columbus’s arrival in America on October 12, 1492. This day is celebrated in many different ways in many different cities across America, based on different interpretations of the people. Columbus Day is celebrated as Día De La Raza (trans. Day of the Ethnic) in Columbia. In schools, students are taught about the discovery and the exploitation of the richness of America. Columbus Day is celebrated as Día de la Resistencia Indigena (Trans. The Day of the Indigenous Resistance) in Venezuela. The people of Venezuela celebrated this as an opposition day. This event was first celebrated when a 100-year-old Columbus statue was damaged in 2004 to proclaim social equality. Columbus Day is celebrated as Día de Descubrimiento entre dos Mundos (trans. Day of Discovery Between two Worlds) in Chile. Columbus Day is celebrated as the Hispanic Celebration or Fiesta de la Hispanidad in Spain, and it’s a celebration of the diversity of the Hispanic community around the world. Though different countries celebrate this day for different reasons. Every year, on the second Monday of October, Columbus Day is celebrated everywhere. 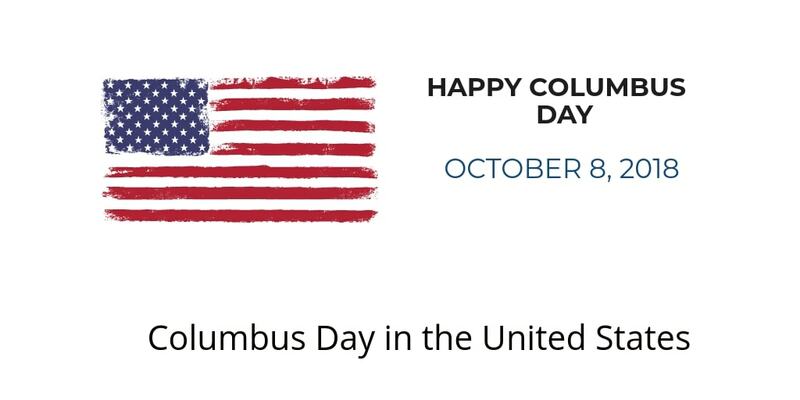 This year the Columbus Day is going to be celebrated on 8th October 2018(2nd Monday of October). Columbus Day is celebrated for various reasons. Among them, one reason is: In the past, most of the countries were under the rule of European countries. During that era, Europeans were in the search of routes to different countries to increase their trade. Most of the travelers and explorers were set out in search of new routes. But the journey of many explorers was not successful as they couldn’t reach their expected goal of finding the routes due to various reasons. Some of the reasons included- the attacks by sea pirates, being destroyed by the violent nature of the sea etc. Some explorers were even successful in finding the routes but they couldn’t tell their tale of success and their journey of hardships because of being killed by the natives. Out of many unfortunate travellers and explorers, Columbus was among the few who were actually fortunate to overcome all the obstacles caused by sea & people and find the route to new land. Christopher Columbus Italian-born explorer who set sail in August 1492, bound for Asia his exploring journey was funded by Spanish monarchs King Ferdinand and Queen Isabella. He was not only successful in discovering the routes but was also able to bring the unknown world into the maps of European travelers. Americans celebrate Columbus Day as Christopher Columbus is often portrayed as the first European to sail to the Americas. Recently, the natives and other groups are protesting against the celebration of this big event because of the fact that this event resulted in the colonization of great America. This event paved the way for slavery trading and killings. But still some people are celebrating it and even the governments are also by conducting various parades. We wish you all the best for Columbus Day 2018 and Happy Monday as well.